Food Costs > How Much Does the Coke Freestyle Cost? How Much Does the Coke Freestyle Cost? The Coke Freestyle was introduced by the Coca-Cola Company in 2009. This is a soda machine that features over a hundred different Coke branded products which are then individually dispensed. If you wish to purchase this machine to use with your business as a replacement for a traditional fountain machine, it will definitely draw customers. The reason this machine is so popular for customers is that it offers them over 100 choices. How much does the Coke Freestyle machine cost? In reference to an article in the Atlanta Journal and Constitution, the minimum cost of the Coke Freestyle is around $2,000. This can go as high as $11,500 once remodeling factors are considered because of the size of the Freestyle machine. Coca-Cola also leases the machines for around $300 a month, according to some restaurant owners we talked to. The said amount is inclusive of the machine only. You need to buy the concentrates to make the soda; not to mention, you may need to contact a contractor or plumber to run water pipes under the floor to the machine itself. To know the exact price of the coke freestyle machine, it is best to contact Coca-Cola directly and ask what it would cost you for the machine to be installed. However, the company will be assessing if your business is eligible for the installation or not. You can check out the nearest Coca-cola office in your area or visit Coca-ColaFreestyle.com. The Coca-cola company is somewhat picky about which establishments they will allow having the Coke Freestyle. Securing the machine may be hard if your business is not that “high in volume.” As mentioned, Coca-cola will determine if your business establishment is big enough or not. Once you are approved, you can have them install the machine. The Coke Freestyle comes with base products of Coke, Diet Coke, Coke Zero, Sprite, Sprite Zero, Mello Yello, Mello Yello Zero, Root Beer, Diet Root Beer, Dr. Pepper, Diet Dr. Pepper, water, Minute Maid, Powerade, Ginger Ale, Fanta, and Hi-C. Once a base product has been chosen, there will be flavor options such as cherry, lime, fruit punch, orange, raspberry, vanilla, and grape. Not all base products will have all of the flavor options. The machine is very large. Therefore, it is possible you will need to rebuild cabinets, cut counterparts, and remodel pipes and flooring for it to be installed properly. You need to contact professionals to do this remodeling and installation, and this will cost you a lot in labor. Professional contractors approved by Coca-Cola will install the machine. This needs to be considered in your budget as well. Of course, the machine will require a lot of concentrate in order to dispense properly. You will need concentrate for each of the base products as well as the flavoring that is used to complete the drink. The machines are currently located with most major Coca-Cola partners and retail locations as a part of a gradual and ongoing deployment. However, only a few are permitted for leasing. You can find these machines in some restaurants, movie theaters, food courts, etc. Depending on the venue or location, drinks in the machine are usually priced around $3. As for the price of the drinks, the super-strong concentrate is more expensive than the regular concentrates for traditional machines. To compensate, Coca-Cola recommends restaurants and other establishments operating the machine to raise beverage prices by a dime. The Coca-Cola Freestyle machine boasts over 125 different Coca-Cola drink products. 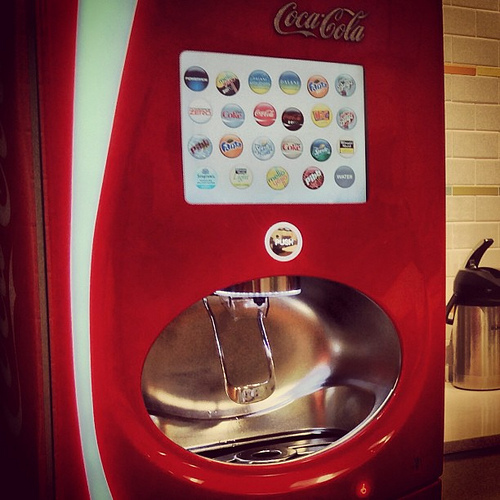 You can check out the site of Coca-Cola Freestyle and locate the nearest machine in your area. You just need to enter your zip code and a detailed map will be presented with the specific locations of the machine. Do your long-term calculations. Make sure that the money invested in the machine will help you gain in the long run. Make sure to price your beverages appropriately. You need to make them affordable enough that customers will continue to purchase them, yet expensive enough to help you cover the costs of your new machine. Purchasing the machine rather than leasing it will definitely save you money in the long run. To lease the machine, you will still have to do some renovations for it to be installed. If the average cost to lease the machine is $300 per month and the machine can be purchased for around $2000, you could have paid off the machine after 7 months of leasing had you purchased it instead.